PORT ROYAL, Pa. – Hanover’s Logan Schuchart scored a convincing win in Saturday night’s 30-lap World of Outlaws sprint car feature at Port Royal Speedway, taking $10,000 for the victory in front of his home state fans. 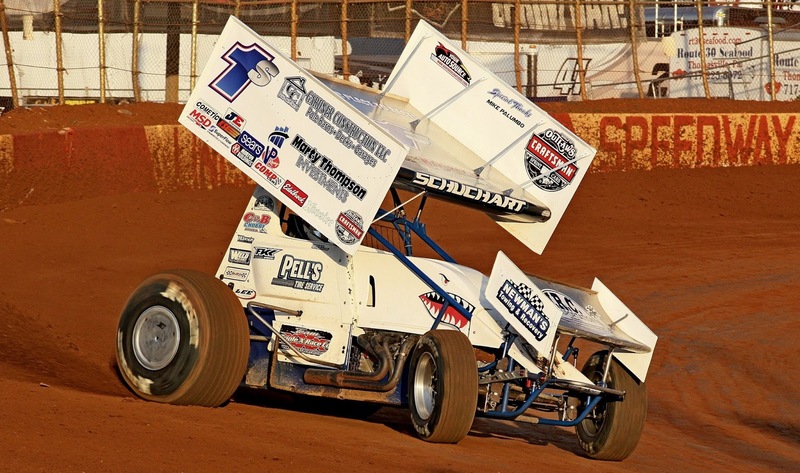 The victory was Schuchart’s second career checkers at the Port Royal oval and it was also his second of the season with the World of Outlaws sprint car circuit after recording his first-ever with the group earlier this year in the Midwest. The 25-lap xtreme stock main was taken by Curtis Lawton who scored $1,000 for the checkers. A stellar 46-car field of World of Outlaws sprint cars signed in for action with Lucas Wolfe setting the overall fast time in time trials with a lap of 15.258 while Schuchart was second quick. Wolfe started on the pole of the sprint car feature flanked by Schuchart with Donny Schatz and Greg Hodnett in row two. Wolfe bolted into control when action began but only two laps could be completed before the first caution flag of the race appeared for a spun Brock Zearfoss in the third turn. Wolfe chose the inside for the double file restart and Schuchart blasted in front of Wolfe for the lead when the field took the green off of the fourth corner. The restart also allowed Schatz to get by Hodnett for third. Schuchart entered the rear of the field on the eighth lap and by lap 10 he had built up a 2.177 second lead over Wolfe. TJ Stutts spun in the second turn with 11 laps down, setting up another restart with Schuchart choosing the inside lane for the new green. And this time Hodnett one-upped Schatz for third, taking the spot away while Schuchart drove away from Wolfe and 10th starter starter Brian Brown got by Daryn Pittman for fifth. At the halfway point Schuchart again had a healthy lead, this time 2.372 seconds. In firm control, Schuchart again hit the backmarkers with 10 laps to go, finding Brown relegating Schatz to fifth as the Missouri driver impressed the fans on his first ever visit to the track. With six laps to go Schuchart was hiding from the field out front as Hodnett rolled to the bottom side and began making time on Wolfe. Simultaneously, 12th starter Lance Dewease was knifing through the field, up to seventh during his assault on the field. Both Hodnett and Schatz surged during the final laps, with Hodnett motoring by Wolfe into second with Schatz following suit for third. Dewease meanwhile tracked down and drove by David Gravel and Brown in the final laps to be alongside Wolfe for fourth on the final lap as the pair raced down the backchute. Aboard a mount owned by his famous grandfather Bobby Allen, Logan Schuchart took the win by 4.705 seconds at the finish over Hodnett, Schatz, Wolfe and Dewease. Sixth through 10th went to Brown, Gravel, Pittman, Brad Sweet and Joey Saldana. Heats went to Schuchart, Schatz, Wolfe and Pittman with the C Main going to Zearfoss and Jacob Allen scoring the B Main. Wolfe won the six-lap dash, setting a new track record with a time of 1:30.002. Brian Walls started on the pole of the xtreme stock main and led the first 18 laps before sixth starter Curtis Lawton muscled into control. Reigning track champion Pete Leister pressured Walls for control after starting eighth but instead, Lawton surged during the second half of the race to use a fast outside lane to get control, passing both leaders at once with six laps to go for the win. Walls was second followed by Leister, Alex Boozel and Deron Henry.